I am so excited to be hosting a fundraiser at Flatbread in Portsmouth, NH on Tuesday, April 7th from 4pm – 9pm! Please come out and join me for some great food and drinks! Flatbread will be donating a portion of every pizza sold (including take out) to my Dana-Farber Marathon Challenge campaign. 100% of the money that I raise goes toward innovative cancer research at the Claudia Adams Barr Program. Here is how you can support me and help us reach the ultimate finishline: a world without cancer. Event listing on Portsmouth Patch! RAFFLE at the door and online. I will be holding a drawing for some awesome prizes this year. You can participate in two ways. First, come out on April 7th and buy raffle tickets at the door OR buy raffle tickets in advance by donating online to my fundraiser. There will be a separate drawing (jar) for each raffle item. If you want to put all your tickets in the drawing for one item you can. Or spread them around. Drawings for all items will be done at 9pm on April 7th. You need not be there to win, I will call you so be sure I have a contact number on your tickets! Buy tickets now or at the door on April 7th. 1. Runner’s Alley $50 gift certificate! 8. Cycle Fierce 5 Ride Pack ($80 value)! 10. Orange Leaf Frozen Yogurt! $20 gift certificate –JUST ADDED! SILENT AUCTION OPEN NOW! You can also support cancer research and get a little something for yourself at my silent auction. The auction closes at 11pm on April 28th. If you “win” the bid or “buy now”, I will contact you regarding payment via a donation to Dana-Farber. If you’re a control “enthusiast” like me, why leave it to chance? Buy now and feel great it’s all for cancer research. 2. Shio Japanese Restaurant $50 gift certificate–SOLD! 3. Original art by Jay Schadler “back channel” view of Portsmouth, canvas. SOLD! 4. Cyclefierce 5 ride pack to CycleFierce indoor cycling studio, Portsmouth. I hope to see you on April 7th or please consider taking part in the raffle and silent auction online! I would also appreciate any donation of any amount to the campaign as well. Also I’ll have my ‘team’ at the fundraiser. 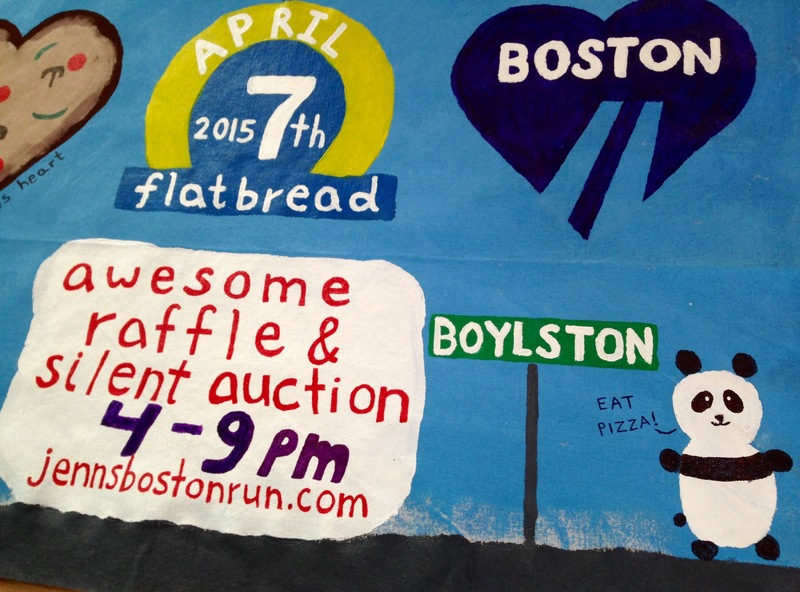 Come find out why there is a panda on our event banner? What’s it like to run a marathon? What the heck is “GU” and why would you eat it? More myths busted and mysteries solved on April 7th! 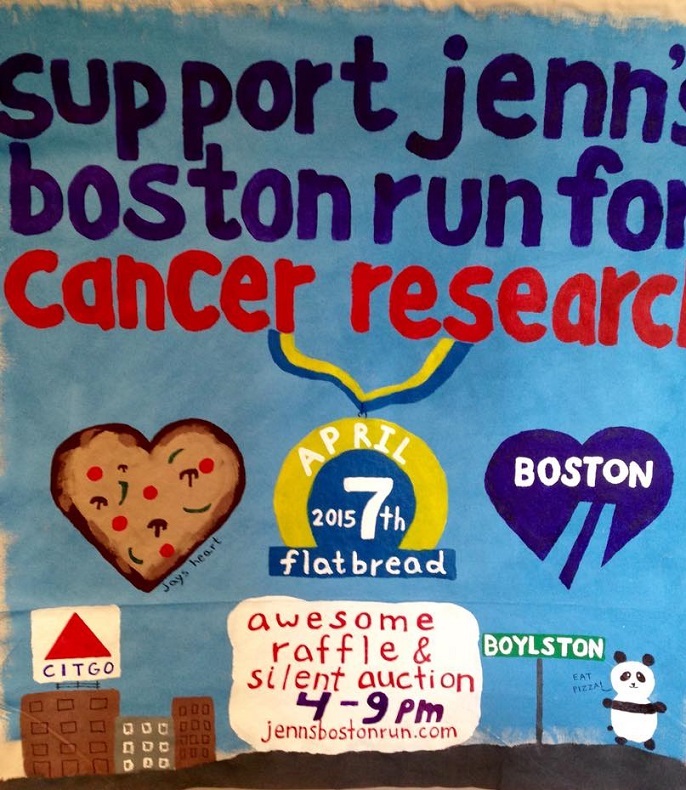 This entry was posted in boston marathon, dana-farber marathon challenge, marathon and tagged auction, Boston Marathon, cancer research, dana-farber marathon challenge, DFMC, flatbread, fundraiser, fundraising goal, jenns boston run, prizes, sponsor a runner, support a runner, winter running by jennsbostonrun. Bookmark the permalink.